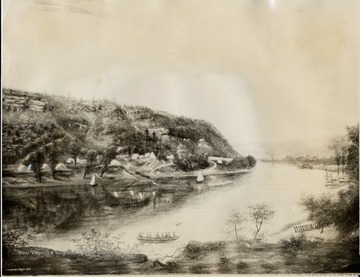 Copy of painting by A.M. Doddridge, 1863- Army camp just below Chesapeake and Ohio Depot site near mouth of Ferry Branch on the Kanawha river. Fort Scammon Hill in the distance. President Hayes and McKinley were stationed in camp. 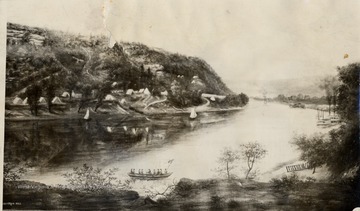 Copy of painting by A.M. Doddridge, 1863- Army camp just below C. and O. depot site near mouth of Ferry Branch. Fort Scammon hill in the distance. Cut No. 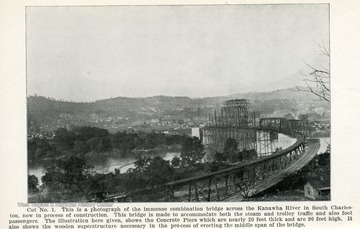 1, This is a photograph of the immense combination bridge across the Kanawha River in South Charleston, now in process of Construction. 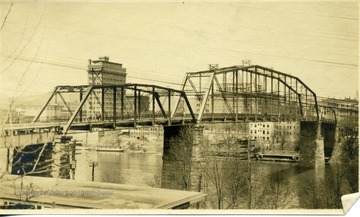 This bridge is made to accomodate both the steam and trolley traffic and also foot-passengers. The illustration here given, shows the Concrete Piers which are nearly 20 feet thick and 90 feet high. It also shows the wooden superstructure necessary in the process of erecting the middle span of the bridge. 4. Bridge Crossing into Charleston, W. Va.
Bridge Crossing into Charleston, W. Va. 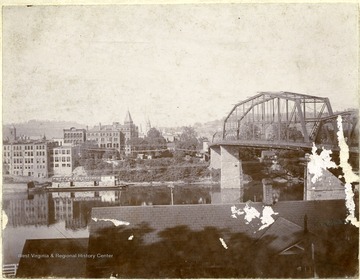 The view of Charleston, West Virginia through a bridge crossing the river. 6. 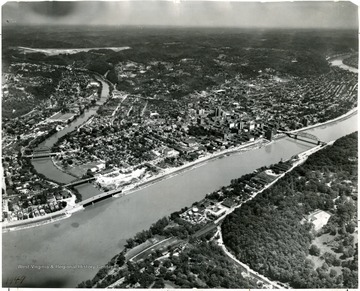 Aerial View of Charleston, W. Va.
7. 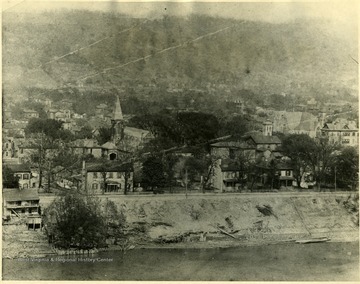 Homes Along the Banks of the Kanawha River, Charleston, W. Va.
Homes Along the Banks of the Kanawha River, Charleston, W. Va.
Homes sit along the banks of the Kanawha River in Charleston, W. Va.
9. Lock No. 2 on Kanawha River at Marmet, W. Va. Lock No. 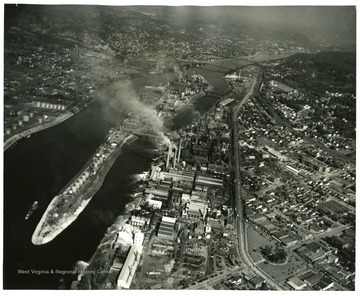 2 on Kanawha River at Marmet, W. Va.
10. 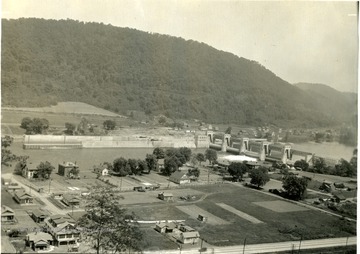 Route 60,Gauley Bridge at Confluence of Gauley, New and Kanawha Rivers in Fayette County, W. Va.
11. 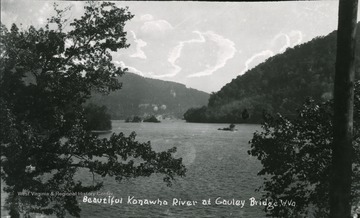 Kanawha River at Gauley Bridge, W. Va.
Kanawha River at Gauley Bridge, W. Va.
12. 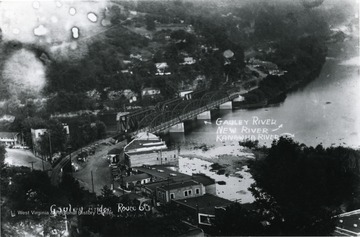 Gauley Bridge, Fayette County, W. Va.